This movie is a must watch for those of you who haven't gotten a chance! Visit the YGR Website and see a little snippet of how the Roundtable discussion went! YGR, a project I am truly in love with. The more progress they make, the more excited I get. Jump on the YGR band wagon yourself and visit the website today. Also, stay tuned for more YGR updates as they are still CASTING for actors to be in the movie. When I know, you'll know. Wow! I just spent the last hour Updating the website. Soon I will have fellow Actor and Arts Enthusiast, Amelia helping me to update this website! Who else wants in? Tweet me, leave a comment here or FB me and I'll hook you up! Check out some interesting piece of writing from local Director, Zan Azlee. APRIL 23 — I’m still suffering from the cold winds of the San Francisco Bay area. Most recently, after the screening of my films and lecture at University of California, Berkeley, I was part of a panel discussion entitled ‘Making movies in Indonesia and Malaysia”. Aside from me, the other panellists included the late Yasmin Ahmad’s producer, Elyna Shukri, and veteran Indonesian actress, Jajang C. Noer. It was moderated by Dr Marshall Clark from Deakin University in Australia. First of all, I was a little intimidated being in the presence of such experienced industry professionals. Elyna had produced some of Malaysia’s most thought-provoking films in recent history, while Jajang has starred in more films than the years I have been alive! WAMM looks different! My last banner sucked. I know. I kinda like the new one. What do you think? Other than that, I'm sure most of you know by now that www.kakiseni.com will be ceasing their operations. I still remember it being my one and only resource for where to go and whats going on when I got out of school many, many years ago and ached to try my hand at theatre. It is a sad thing indeed to find that the site will soon merely be an archive of the last 9 years. That being said, instead of moping about. I will try to do more than just organise screenings every couple of months with Actors Studio. As you can see above, I will now attempt to update everyone who cares about AUDITIONS, SCREENINGS & EVENTS that may be of interest but are lesser known for whatever reason. Stuff you might have found on Kakiseni previously. Alas, I am just one guy, so I am calling out for contributors. You, the person organising all kinds of stuff - rather than just updating your own website and your own networks, why not join 1 common platform? Lets create one common platform. Lets get it made! 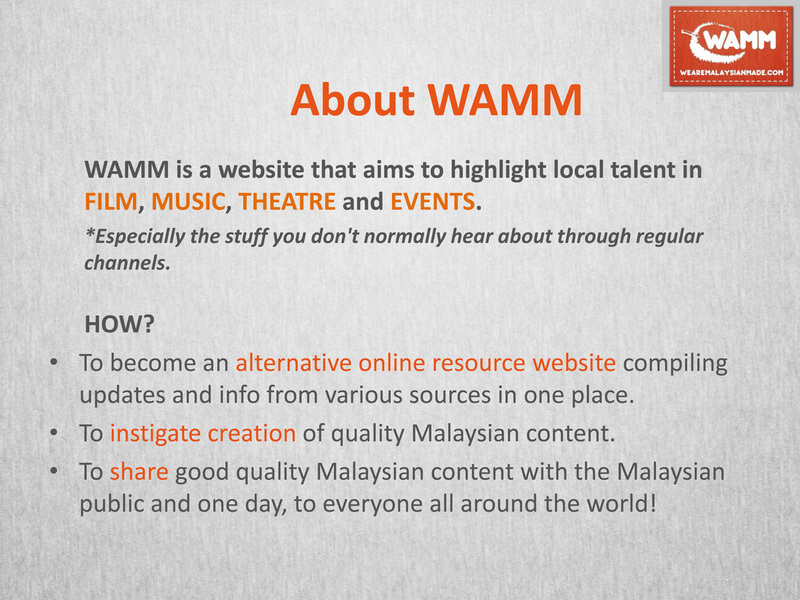 Filmmakers, Event Organisers, Producers, Actors, Directors, Artists, Flea Market Vendors - everyone and anyone - join WAMM and as you are updating your website, why not update here as well? As the dude in the Jerry Maguire video said, "That's how you become great man...hang your balls out there..."
The following is lifted from the FB Event Page. They'll be screening BABY THE RAIN WILL FALL and THE INVIGILATOR. 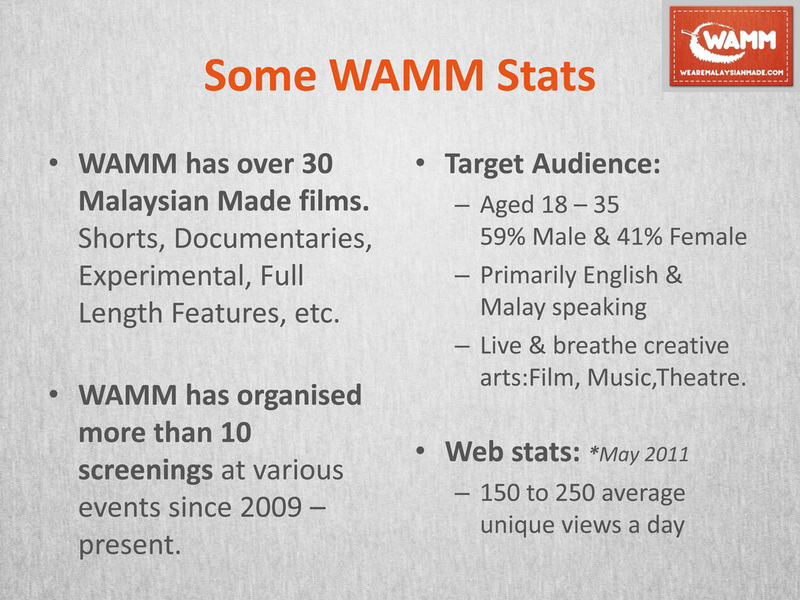 2 shorts that have been screened by WAMM in the past! Great stuff, go watch! The following is lifted from an email I received, if you're looking for another screening, go check this one out! For the April edition of our monthly film night (now always on a Tuesday) and after a year-long hiatus, Filmmakers Anonymous (http://www.filmmakersanonymous.blogspot.com) and Palate Palette happily teams up again to present another array of new and emerging films: compiled, not curated, from among like-minded people who are just addicted to making films - for whatever noble or twisted reasons. This month, we're showing 7 short films from Filmmakers Anonymous 10, which features entertaining shorts by talented filmmakers like Nazim Esa, Kevin Ng, Chi Too, Mien.ly, Manesh, Crystal Kay, Kubhaer and Nadiah Hamzah. Come join us! Screenings are free! And so is our popcorn! If you don't know how to get there, check out http://palatepalette.com/ , their website. Casting Call for YGR! It's happening this 10th APRIL 2010, SATURDAY between 10am - 6pm. Click HERE for the FACEBOOK Event Page and HERE to read more details about it at YGR.com . Ladies & Gents, if you attended our 2nd Screening for the year of 2010, you would have heard Manesh Nesaratnam talk about YGR.com and how they are now close to finalising the script of YOUR MOVIE. Check it out HERE for more details of the cast they are looking for! Because the nature of the film is a multi-layered ie 'Banyak Story lah', your chance of getting in on this film is quite good!. So attend the AUDITION or send in your own YouTube recording quick! In fact, I got together with friend Melissa Campbell and did our own little audition video and will be submitting it too. Check it out here first! Thank you very much to THE ACTORS STUDIO for giving me a platform under FUSED to conduct my 2nd screening of 2010. A big shout out to all the Directors for letting me showcase your wonderful works. And of course not forgetting (YOU) the people who came. My target was 50 people and 56 showed up! A modest and happy number for me. There will be more to this write up on another day. Till then, thank you for your support! For more updates, join WAMM's FB Group or follow @michaelcsm on Twitter.